Robert Perry, at the Consortiumnews.com, an independent website promoting "...Investigative Journalism Since 1995," wrote a piece on Election Day titled, "Power of Anti-Government Propaganda," a short history lesson dispelling the Conservative version of American History. "Parry broke many of the Iran-Contra stories for The Associated Press and Newsweek in the 1980s. You can buy his new book, America’s Stolen Narrative, either in print here or as an e-book (from Amazon and barnesandnoble.com). "This animosity toward the federal government explains not only the Tea Party’s victories in 2010 but the buoyancy of Mitt Romney’s candidacy in 2012 despite his stunningly dishonest campaign and his off-putting political persona. "The hard truth for liberals and progressives is that the Right’s imposing propaganda machinery can make pretty much make anything into anything, whatever serves the Right’s ideological and political needs, while the Left has nothing to compare to this right-wing capability. "For instance, the Right’s propaganda has convinced many Americans of a bogus historical narrative which has the Framers enacting the Constitution as a states’-rights document designed to have a weak central government – when the reality was nearly the opposite. 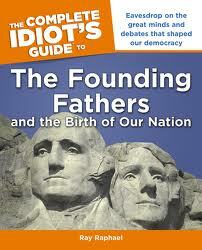 "The key Framers, James Madison and George Washington, organized the Constitutional Convention in 1787 to rid the young country of a governing document, the Articles of Confederation, that declared the states 'sovereign' and 'independent' and gave the federal government very limited powers. The Constitution stripped out the language about state sovereignty and made federal law supreme. "As Washington had noted earlier in supporting one of Madison’s ideas – to give the federal government authority over interstate commerce – 'the proposition in my opinion is so self evident that I confess I am at a loss to discover wherein lies the weight of the objection to the measure. "Washington had personally witnessed the dysfunction of the Articles of Confederation during the Revolutionary War when the “sovereign” states balked at sending promised supplies and money to his Continental Army. "After the war, Washington recognized the need to build a national infrastructure of canals and roads to enable the sprawling young nation to grow and to succeed. That practical interest became a key factor for Madison as he devised the new Constitution with an explicit clause giving the federal government power over national commerce, the so-called Commerce Clause. "In Federalist Paper No. 14, Madison described major construction projects made possible by the powers in the Commerce Clause. '[T]he union will be daily facilitated by new improvements,' Madison wrote. 'Roads will everywhere be shortened, and kept in better order; accommodations for travelers will be multiplied and meliorated; an interior navigation on our eastern side will be opened throughout, or nearly throughout the whole extent of the Thirteen States. "The Framers expressed through the Constitution what might be called a Founding Pragmatism. The Articles of Confederation weren’t working because the central government was too weak so the likes of Washington and Madison scrapped the Articles and created a strong central government under the Constitution. "The spirit of Washington’s and Madison’s pragmatism reemerged in the 1930s in the economic sphere. Laissez-faire capitalism had failed, marred by a series of financial panics and recessions through the latter half of the 19th Century and into the 20th Century, finally culminating in Crash of 1929 and the Great Depression. "At that point, President Franklin Roosevelt invoked the broad powers of the Constitution to impose regulations on Wall Street, to organize a national effort to put Americans back to work, to legalize labor unions, and to expand the nation’s infrastructure. His New Deal also created a limited safety net for Americans who were unable to work or who lost their jobs due to the vicissitudes of capitalism. "Subsequent presidents built on Roosevelt’s reforms, through such measures as the GI Bill, which helped World War II veterans buy houses and return to school, and the Interstate Highway System, which made transportation faster and cheaper. The federally funded Space Program provided a powerful impetus to technological development, and Medicare addressed the problem of families being impoverished to pay for medical treatment of senior citizens. "Overall, the reforms from the 1930s through the 1960s created the Great American Middle Class, which in turn fueled more economic and productivity growth. As Washington and Madison might have appreciated, the pragmatism of their founding document had helped make the United States the envy of the world. "In the 1950s and 1960s, the federal government also began enforcing the legal framework for equality that had been enacted nearly a century earlier after the Civil War. The South’s walls of segregation were battered down by a combination of brave civil rights activists and a supportive national government. "That federal intervention, however, revived the old conflicts over states’ rights, with many white Southerners furious that they could no longer marginalize, humiliate and terrorize blacks. Under Richard Nixon, the Republicans also spotted an opportunity to peel off Southern states from the Democrats by appealing to these racial antagonisms. "The 1970s marked an important political turning point in the United States with many middle-class Americans having forgetten how they and their parents benefited from the New Deal, with many working-class whites resentful of gains by minorities, and with frustration building over a decline in American dominance in the world. The Vietnam War was lost; oil-producing states were banding together to raise oil prices; inflation soared; foreign competition increased; wages began to stagnate; and the environment became a concern. "The Right – detecting an opening amid these public resentments – began to pour vast sums of money into creating a right-wing propaganda system that combined sophisticated think tanks with extensive media outreach to the American people. The overriding message was that Big Government was the problem, interfering with states’ rights, corporate autonomy and individual liberty. "During Reagan’s First Inaugural Address, he declared that 'government is the problem' and he soon enacted drastic cuts in the income tax rates for the wealthy. This policy of wealth redistribution to the upper levels was justified by a novel economic theory called 'supply-side economics,' which held that the rich would then invest in new factories and other businesses, thus creating new jobs and improving productivity. 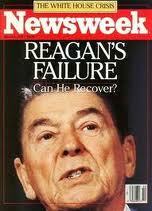 "However, Reaganomics proved terribly flawed. The rich invested relatively little in U.S. manufacturing which continued to decline, while the well-to-do lavished themselves with luxury goods and showed little patriotism in where they did put their money, favoring fast-growth foreign countries, not the United States. 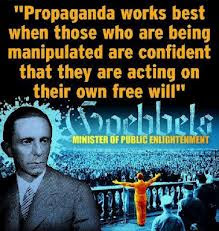 "Yet, the Right’s propaganda system – now fueled by the diversion of money to the upper classes – continued to expand with right-wing media moguls buying up or starting up all sorts of new outlets, from newspapers, magazines and books to radio, TV and eventually the Internet. "The anti-government message became pervasive, sometimes cleverly tailored to specific interest groups, such as young white men who were told that they had become the victims of 'political correctness' when they faced punishment for uttering racial or sexist epithets. Even as millions of Americans were pushed down the ladder of personal success, many kept believing that the federal government was somehow at fault. "In this hostile climate, many Democrats also scurried to the center and struggled to protect the core programs of the 1930s and 1960s, the likes of Social Security and Medicare. But they made major concessions on issues like Wall Street regulations, enabling freewheeling casino capitalism to return. "The consequences of decades of Reaganomics and hostility to 'guv-mint' landed on the American electorate just weeks before Election 2008 when Wall Street experienced its worst financial crash since the Great Depression. "The collapse helped Democrat Barack Obama to become the first African-American U.S. President, but the underlying ideological realities hadn’t changed. The Republicans recognized that fact and immediately went to work seeking to ensure that Obama would be a one-termer, even if that meant worsening the suffering of Americans. 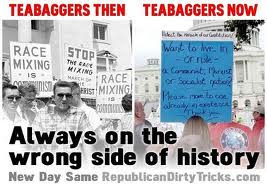 "Drawing from the power of the Right’s propaganda machinery, the Tea Party quickly emerged as a potent force in U.S. politics. And, as Obama futilely tried to gain some bipartisanship in Congress, the Republicans worked to make his political life miserable and the country as ungovernable as possible. "Their success can be measured in the Republican congressional victories in 2010 and the closeness of the election in 2012 as Obama sought to refashion the argument for an effective federal government as a fight to protect the embattled middle class. "However, Obama found himself arguing against a powerful and longstanding dynamic: how tens of millions of Americans had been taught to hate their own government." No one who has kept up with the Conservatives' machinations since their delivery of the Great Depression to us can possibly think that their drive towards complete power is done. No one with a modicum of sense can believe that their drive to usher in the New American Feudalism has been stopped with the re-election of President Obama. If we stop to "compromise" with those who are desirous of eliminating all compromise - as they have proven over the last four years, we may as well just hand them the Constitution, together with a can of kerosene and a book of matches. The Conservative march to total oligarchy is alive and well, and the only way to stop their relentless march is to criminalize their murderous activities.